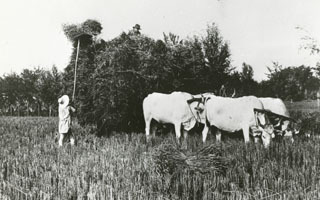 Wheat was the most important crop in the sharecropping system of the Bolognese plains, cultivated on nearly half the available land. The harvest determined whether the tenant farmer family would have enough grain to produce subsistence levels of bread and pasta until the following summer, after having put aside the requisite seed for fall planting. The wheat production of tenant farmers also determined how much grain, flower and bread would be consumed by the working class of city-dwellers, as well as the income earned by the owners of medium and large farms.